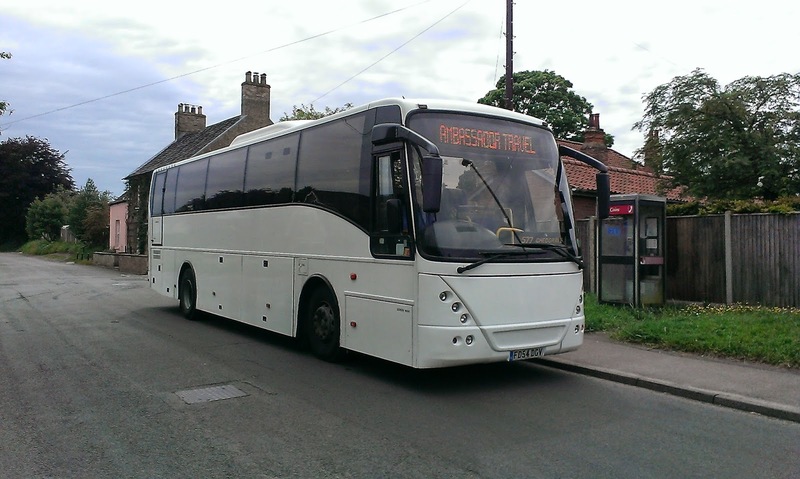 I am once again indebted to David Warren, who has sent me a couple of pics of newly arrived First Yorkshire Wright Renown Volvo B10 60618 which is covering for a few months while the Ipswich fleet is being reburbished. 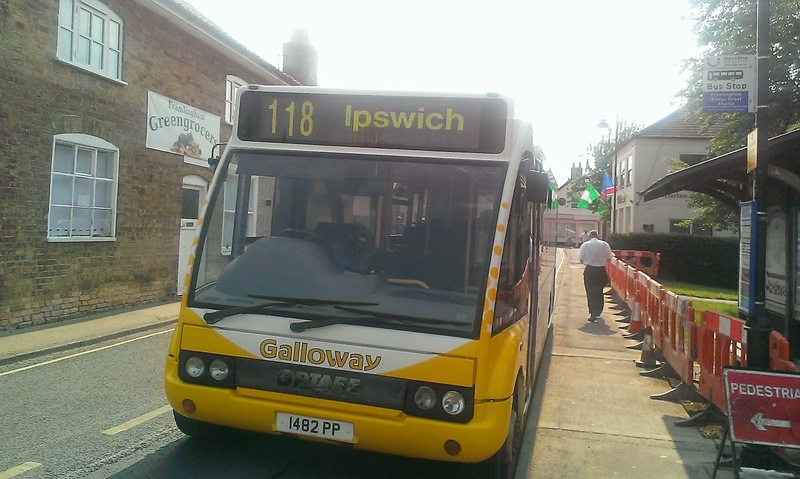 Clive Nixon of Ipswich Bus Blog tweeted this afternoon that another loanee 62143 has also arrived. Many thanks for the pics David, and my word she looks quite smart for a 17yo! 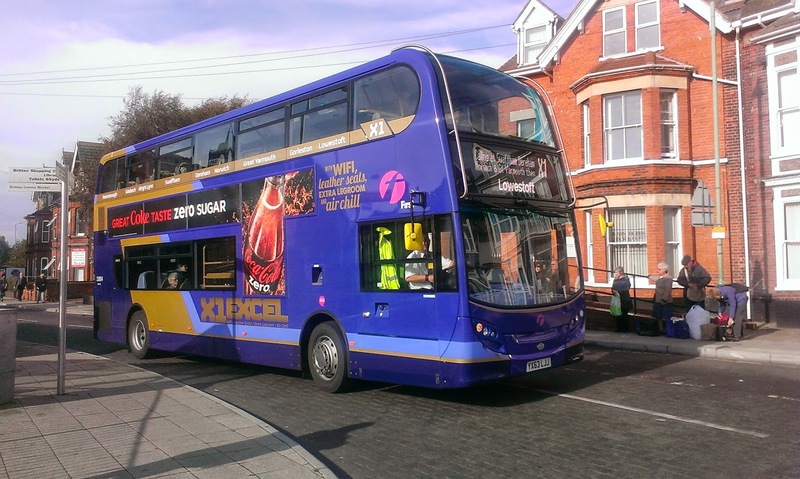 Brian Elliss has been in touch to alert me to applications on the VOSA website made by Ipswich Buses. 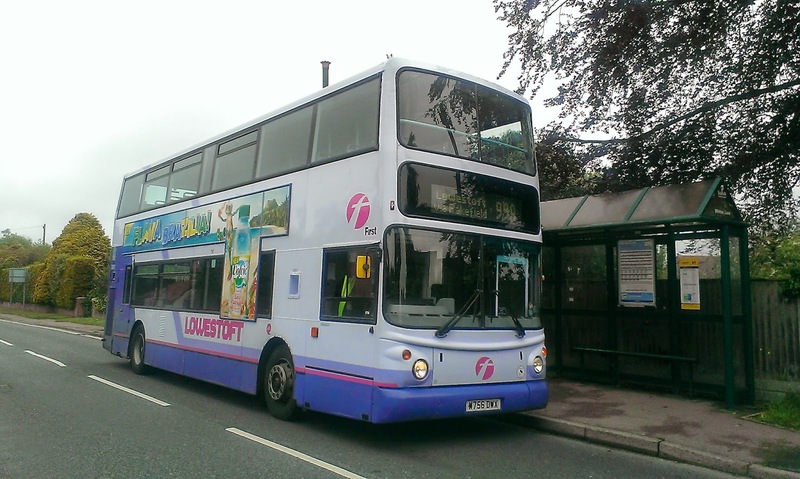 First of all they are once again withdrawing the 2 from 21st July, which runs from Tower Ramparts to Gainsborough via Derby Rd. I used to live close to that route and then it was a 20 min service. It was reduced to an hourly service some years ago after residents protested against its complete withdrawal but now it seems it is going. A hole to be filled maybe? 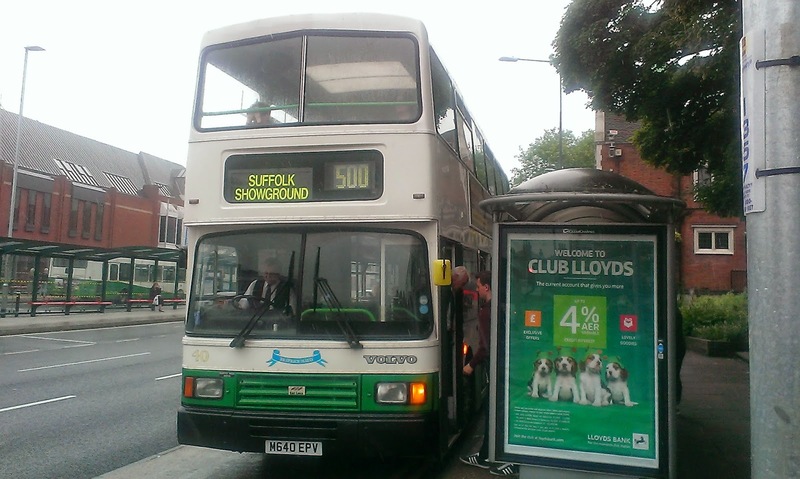 Secondly Ipswich Buses are starting an hourly Sunday service from Ipswich to Felixstowe, given service number 33. This will start on 27th July. Only time will tell if this is the prelude to an all out war on the Felixstowe route but we shall see. Many thanks, Brian, for the heads up on that. 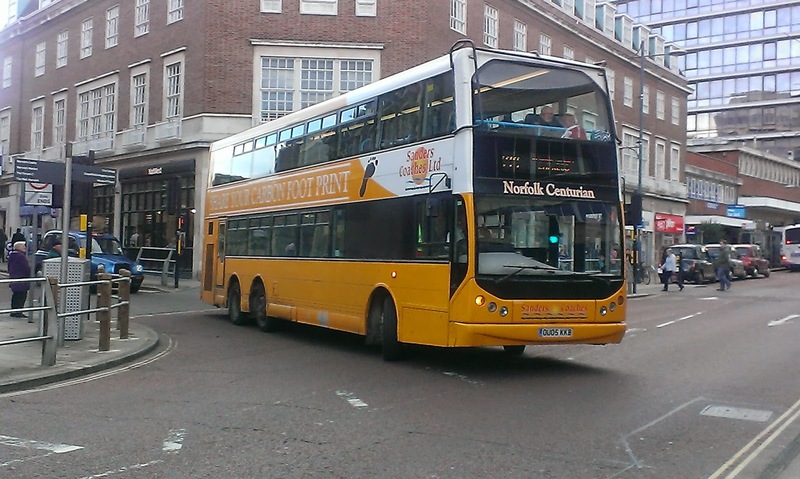 Shooting up to North Norfolk and Sanders have announced on Twitter that two of their giants, 102 seater Volvo B9's "Goliath" and "Norfolk Centurion" OU05 KLA/KKB have left the fleet. That is sad news as they really stood out from the crowd. I hope they are replaced with vehicles just as striking. 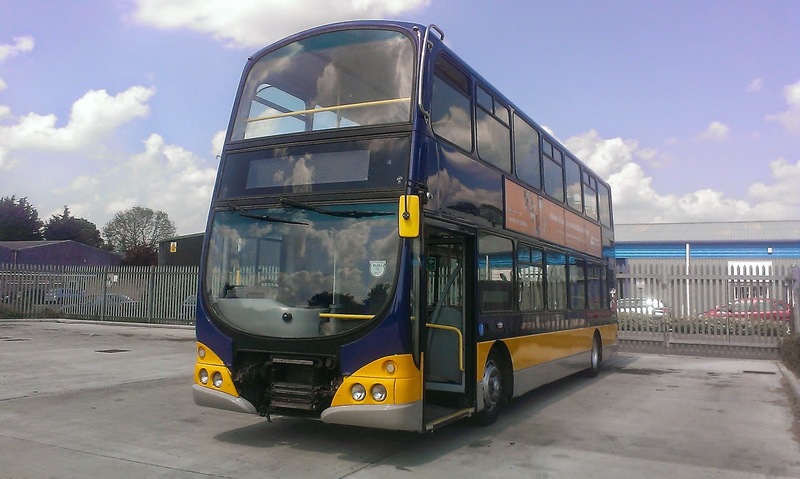 Finally tonight Ipswich Bus Blog report that the latest two vehicles to go to Rotherham for refurbishment are 69008 AU05 DMV and 66981 KX05 MHK. 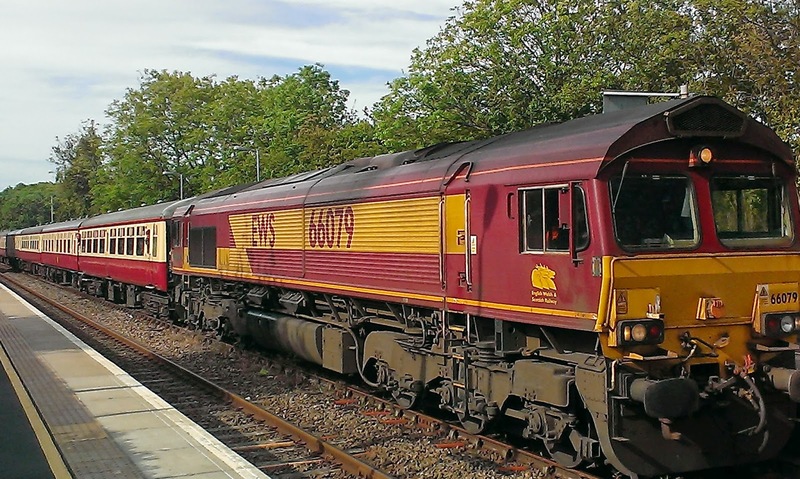 It is also possible that First Norwich B7's 69006/11 have already been painted prior to transfer to Ipswich. if anyone can confirm if they are still at Norwich or not I'll be grateful. Many thanks to Clive for getting in touch and you can read his full report here. It was the second and final day of the Suffolk Show today and I was in Ipswich to see what was on the shuttle to the show. Quite a lot as it goes including vehicles you are unlikely to see in public service during the rest of the year. It is a long shuttle, running from London Rd P&R site to Martlesham P&R site via Tower Ramparts and Trinity Park, where the show is held. 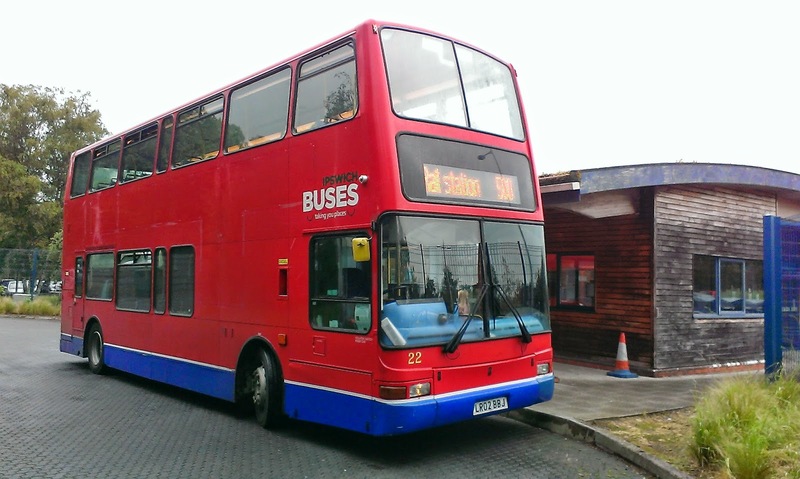 Today there were 5 ALX400 Tridents, 1 Plaxton President Trident still in Metroline livery, 2 Optare Spectras and joy of joys 2 20yo Volvo Olympians. Guess what I caught there and back!! Here is a selection of the pics I took today - more on Flickr in the next couple of days. My apologies to Robert Collins who posted his comment before I posted this but gmail hadn't alerted me to it. Many thanks, Robert. I have solved my own conundrum. 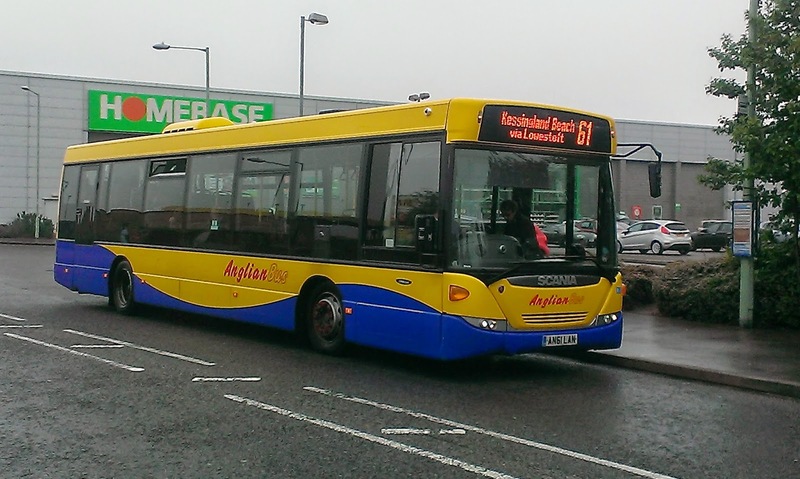 Anglian 462 started life at Metrobus with fleet number 538 which explains the identification marks but doesn't explain why they are still there!! 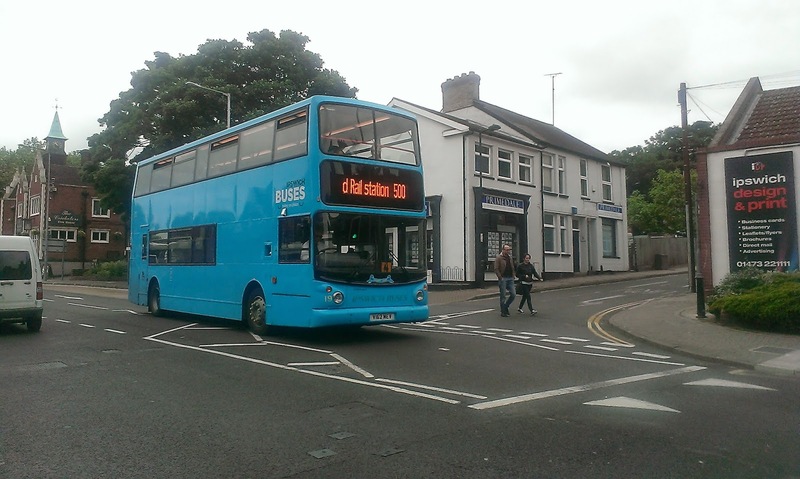 Anyway here she is in her Metrobus colours at Showbus no less in 2004. Pic by Ian Roberts on Flickr whose extremely varied photostream you can find here. 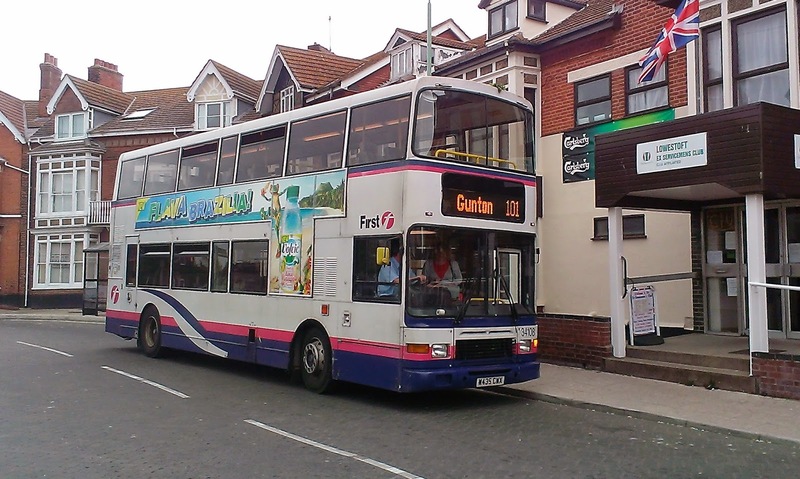 While East Anglia was drying out from yesterday's rain that has prompted fleet managers in the area to contemplate investing in outboard motors for their vehicles I returned, this time with my bus pass, to Pakefield for Day 2 of the 99's. To be honest as I had arranged to meet other bloggers in Yarmouth I wasn't there as long as yesterday but saw all I needed to know. On the route this morning was 45113 from yesterday, and a surprise in ALX 400 30901. I took the opportunity to take a trip on the route on 30901 and had the top deck to myself all the way back to Lowestoft. I have no idea what the third vehicle was today as I didn't see it, which since they are meant to pass by Pakefield School was quite a surprise too. Now for some observations. It would appear that First's main rivals in Kessingland are not Anglian but the residents themselves. Even yesterday residents were telling me of their intention to stay loyal to Anglian,and this was reinforced today. They are going to take some persuading. 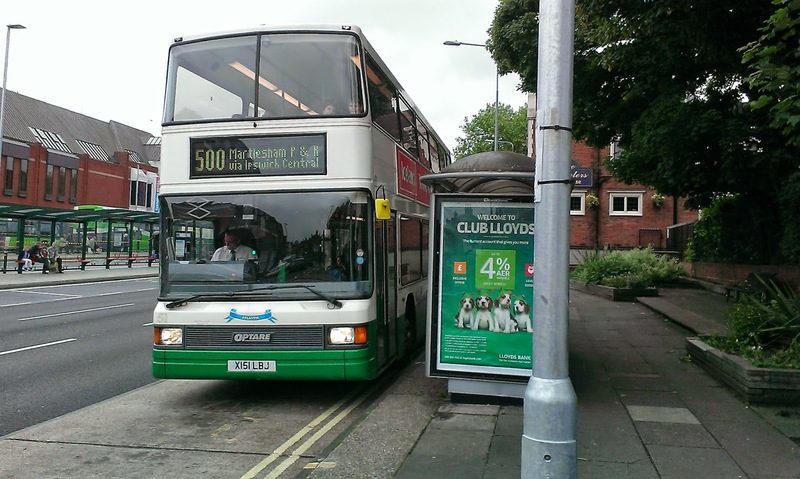 Secondly I have yet to see a timetable at any stop on the 99 route - even at Lowestoft Bus Station Stop 7, where the 99 leaves from there is nothing advertising the fact that the service even exists. I think the next few weeks could be quite interesting. 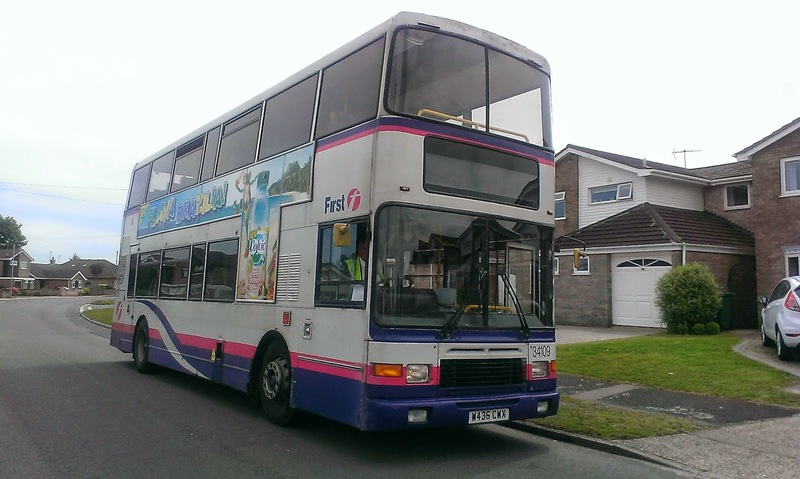 So after an excellent journey on 37578 to Yarmouth - those Geminis are really suited to the 1/1A - I met up with Roy from East Norfolk Bus Blog and Cameron from Yarmouth Bus Page and we decided a wander in the drizzle to the coach park was in order. 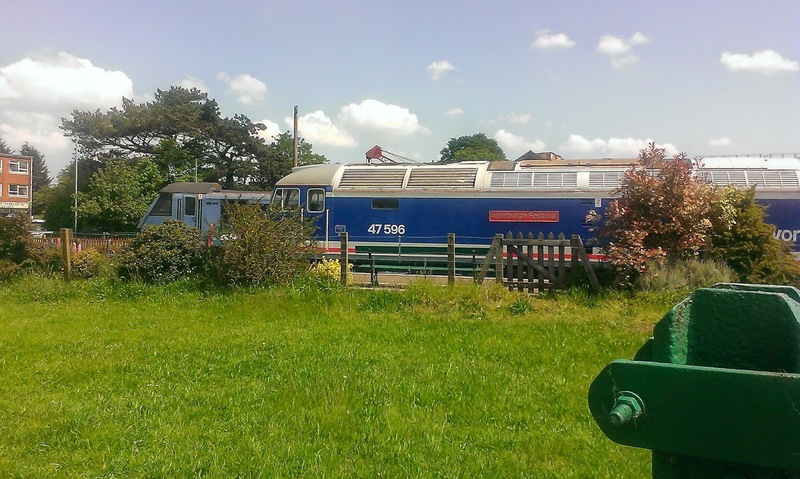 Prior to that I had seen recently arrived ALX 400 30258 out in service for the first time. 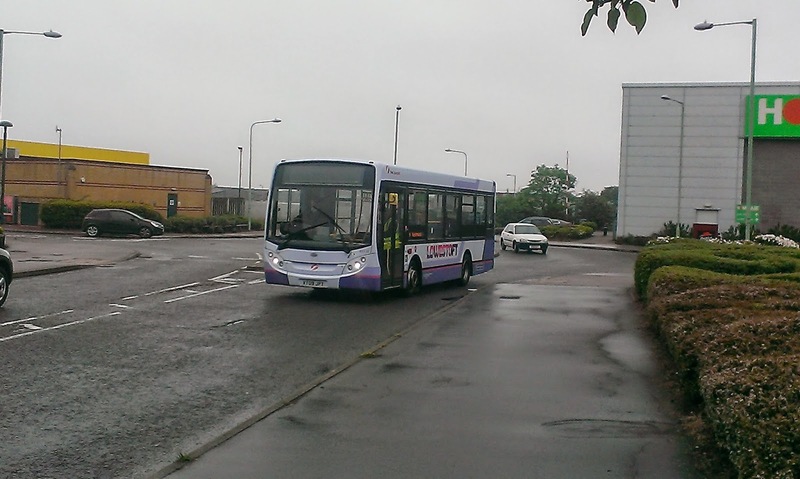 Not much to see at the coach park, mainly because my glasses were full of drizzle, and not even too much to see at Caister Road depot, but I had a cunning plan in mind,and after some shopping caught Olympian 34114 back to Lowestoft - those Olympians are really suited to the 1/1A!!! The second of two really good journeys on First today. 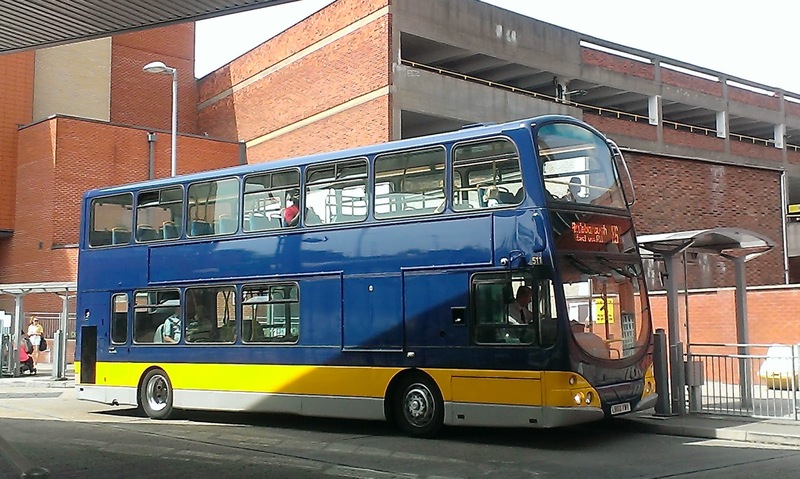 My day was then made complete by a rarity on the 61/62 - Scania Omnicity 460 YN05 HFF which I prefer to the Omnilnks. 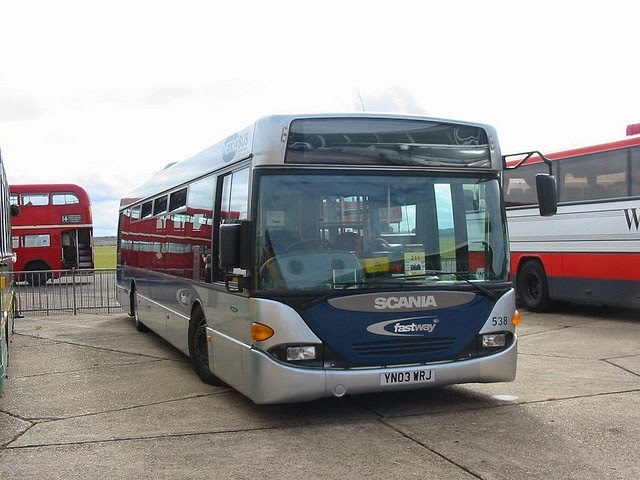 Off to Ipswich tomorrow to see what is on the County Show shuttles. Finally a little puzzle for you all. I took this pic of the roof of Anglian 462, Scania Omnicity YN03 WRJ from the top deck of 37578 earlier. Can anyone tell me what the letters and numbers in black denote? 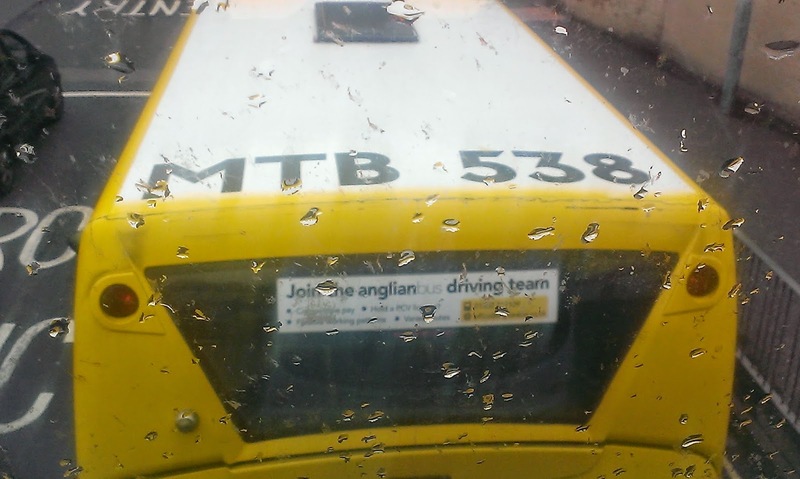 Is it a legacy from a former operator as I've never noticed any other Anglian vehicle with such identifying marks. Answers to comments please! The roof of Anglian 462 YN03 WRJ. Any ideas as to the meaning of the code? I am once again indebted to Tim Miller, who seems to spend his time donating stuff to us bloggers! Tonight he has shared with me a youtube video he has found of the Backwaters Tour 66 plus 11 coaches going through Reedham. The video also includes 170201 and my favourite bit an appearamce by a fox! Thanks, Tim - I don't know what we would do without you! Yes I know it officially started on Sunday but in my world public transport doesn't exist Sundays or Bank Holidays so as far as I am concerned it started properly today! I had hoped to spend most of the day up in Pakefield monitoring things but was thwarted by firstly the weather which has caused no end of problems today and certainly wasn't suitable for hanging around watching buses. Secondly that same weather will have affected the numbers of people travelling so an accurate assessment of the impact of the 99 would have been equally as impossible, and of course Numpty here left his wallet at home so couldn't do shopping or bus hopping as planned. So I managed to re-arrange minibus home and have been sulking in front of the tennis! But for the hour I was there two things were obvious. Firstly the timetable went up the wall due to the weather and Lowestoft bridge going up. Secondly it seems First aren't going to bother challenging the gas bus's level of ride and comfort as they had 3 E200's on the route. 45112/3 DK57 SXF/G and 45116 VT09 JPT were on the route today. I will be back out tomorrow, memory and weather permitting for a more accurate assessment. UK Railtours had a charter train rather dubiously called Anglian Backwaters going through the region today. 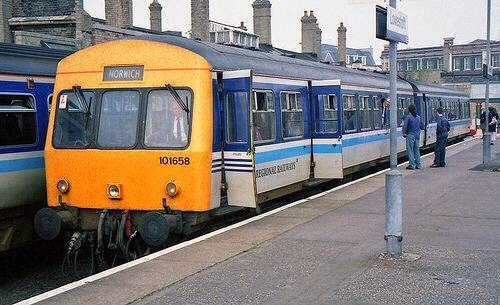 It started at Finsbury Park and went to Lowestoft via Cambridge, Ely and Norwich. 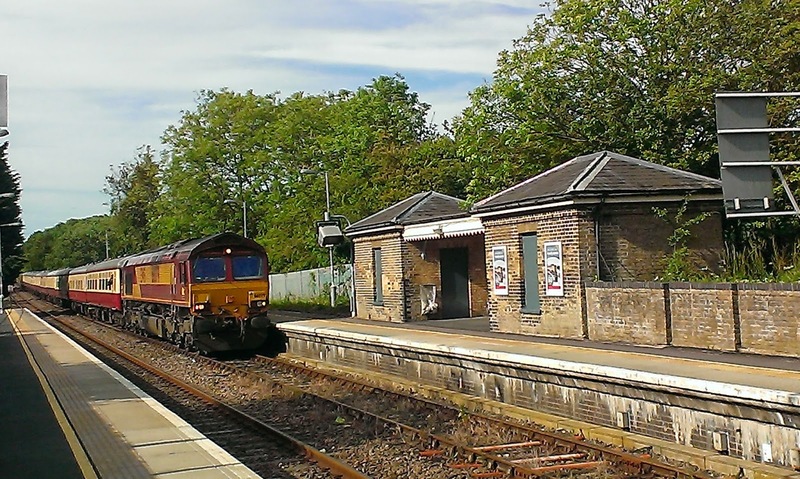 It returned via the East Suffolk Line before being the first passenger train to use the new Europa Junction in Ipswich then going back to Cambridge via Bury and Newmarket. Since I live not to far from one of those "backwaters" I dusted the bike off and arrived at Darsham Station with 5 mins to spare. It was a shame the loco wasn't more exciting than a class 66 but it was still good to see a train that big going through Darsham, which is used to 2 and 3 coach DEMU's. 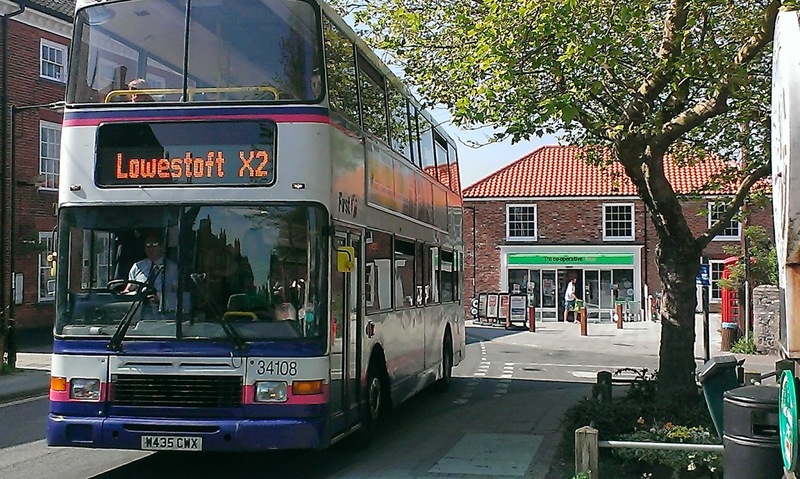 Due to long term roadworks at Postwick which are scheduled to last an obscene 72 weeks (that's two Summers - great planning) the X1 will be split at Norwich, meaning holidaymakers will have to lug their cases off one bus and onto another in order to get to Yarmouth and Lowestoft. On the plus side it should help with punctuality IF there is enough make up time incorporated into the layovers at Norwich and Lowestoft. 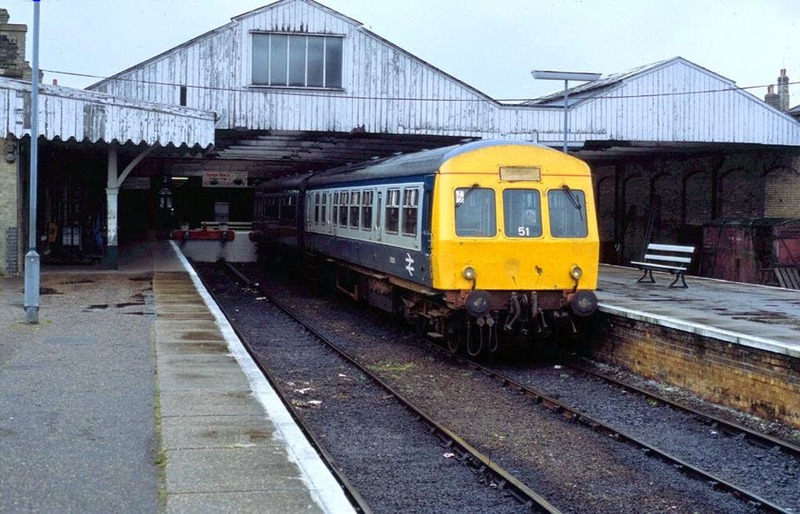 It will also mean some of the E400's based at Yarmouth or Lowestoft. Gerard describes the other changes as "sensitive" but will improve the service for "the majority of customers". After hearing a consistent rumour this week from several sources I have no doubt what it is (please don't ask as I won't tell you) and I'm not in the least bit surprised. However the X1 is Gerard's territory and I will let him make announcements as and when he can. 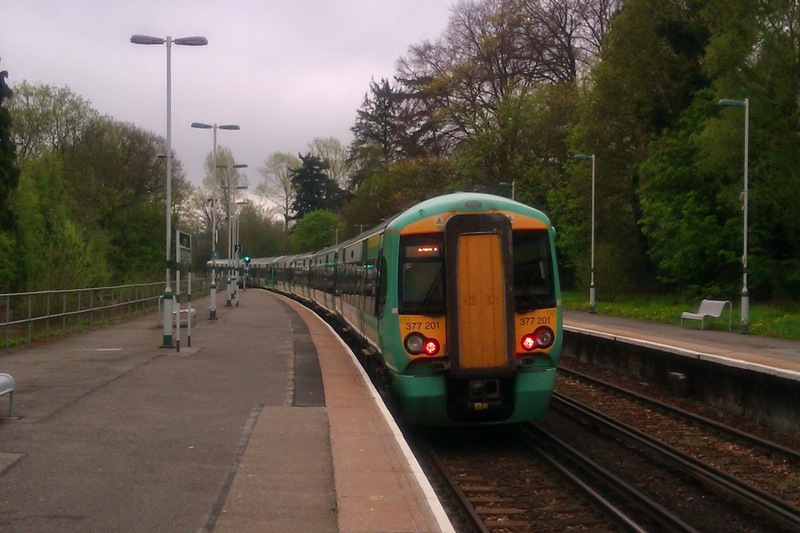 Andy's Bus Blog has announced that Govia, a joint venture between Go-Ahead and Kelios have been awarded the largest railway franchise ever awarded, which covers the current Thameslink, Southern and Great Northern Franchises. Investment in new rolling stock, station and infrastructure improvements is going to be huge, with 1,400 new carriages being rolled out by 2018, and up to 24 trains an hour in each direction between Blackfriars and St Pancras. 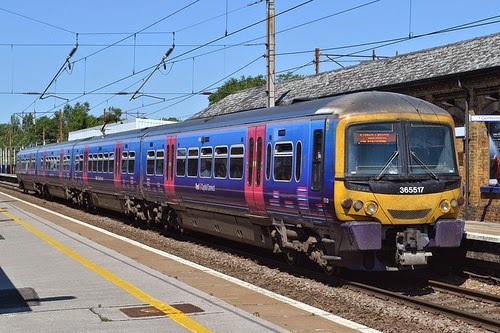 The Thameslink and Great Northern (currently First Capital Connect) networks will be transferred to Govia on September 14th this year, with the Southern franchise to be added on July 26th 2015. In addition a few South Eastern stations and services will be transferred to the new franchise. You can read Andy's full report which quotes the D of T press release here. A varied day today with a couple of unexpected journeys. Started off as usual with the Scania Omnidekka from Halesworth to Yarmouth getting there just in time to catch Olympian 34109 to Bradwell and back - so that's the complete set of Olympians ridden on in the last two weeks. So good to see so many of them still out and about with 34186 to come back in a few weeks. Shame that means 34187 going though. I was hoping for a double Olympian journey but sadly the 1250 to Belton wasn't Olympian operated today. However, after a spot of shopping I got back to Market Gates to find soon to be departed to Lowestoft 37562 sitting on the X1 stand about to leave for Norwich. So after a quick pic I boarded her and she really is a nice bus. I'm looking forward to riding her on the X2 next week. If she goes that is. The Dart that was reported to be going to Lowestoft yesterday - 42358 - has been sailing around merrily on the 2's all day. 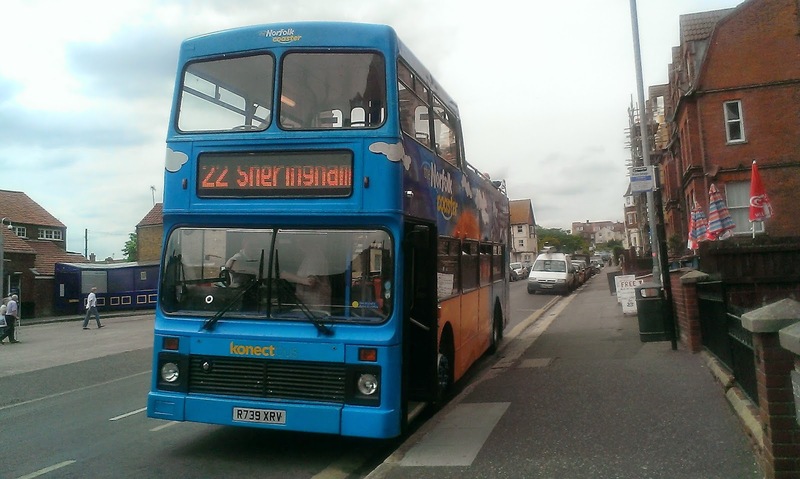 At Norwich I took the chance to ride another of Konect's newly arrived Ex London Geminis. 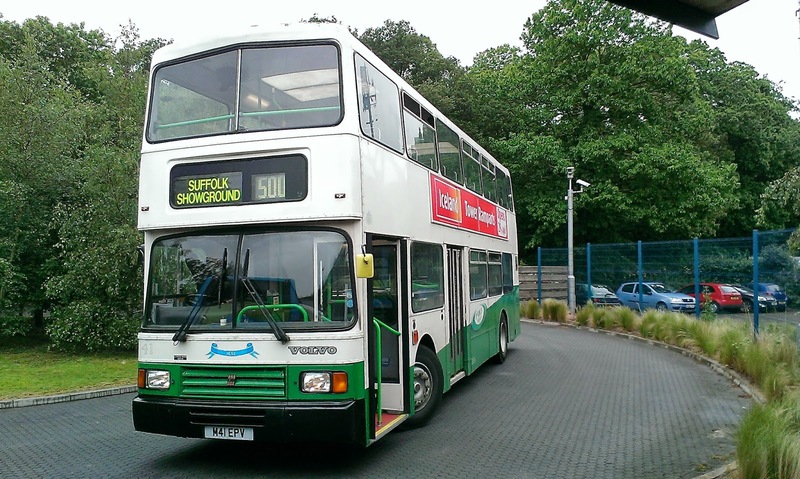 This time was 511 LB02 YWY which was on the X6 to Attleborough, and like 512 I was inpressed by the ride and the comfort. in fact I like them more than Konect's E400's, which are the best around. I have been really pleasantly surprised at the quality of the conversion of those Geminis. Well done to all concerned. I'm not out again till tuesday, when of course all eyes will be on Kessingland. between now and then there maybe a couple of special posts whcih I haven't decided on yet so keep checking! I was at a loose end in Yarmouth today, as someone rather inconsiderately put a President on the 1250 to Belton instead of the usual Olympian, when one of Ambassador's coaches pulled up on the Wednesdays only service 577 going to Chedgrave. I got chatting with the extremely friendly driver Graham (hope that's the right spelling buddy) and decided to take a trip out there. A nice Volvo B12 coach in good nick for its age, a friendly driver and some impossibly narrow country lanes made it almost like a mystery tour. Cheers, Graham - it may well not be the only time I make that trip. As my personal mileometer clicked over again today I had held back on doing something most other enthusiasts did weeks ago - which was to go up to Cromer and sample the open top Olympian but without the need for thermal underwear! A nice day, sunshine and the wind rushing through my hair was quite acceptable. Another Olympian in good condition giving a really decent ride. They really do put more modern vehicles to shame. Now what I haven't seen so far among the many pics published are any interior shots, I mean exterior shots from the inside oh pics of the upstairs!!! So here we go - I like the layout with the covered section totally separated by a partition and door from the open section. The top deck looking forward with the partitioned enclosed section - looks a but like a boat and you expect a ship's wheel by the front window! And finally, following on from yesterday's pic of Konect's recently delivered ex London Gemini 510, here is 511, which only entered service last week, and which I haven't seen pictured anywhere else. Note that as yet no ads have been applied to her, which makes her look rather good. What a glorious day. Today's mission was to go to Dereham to photograph the poorly Greater Anglian Class 90 loco awaiting road transport to Crewe for bogie replacement. 90010 suffered catastrophic failure at Shenfield a couple of weeks ago, and as it is impossible to get a low loader into Crown Point it was gently pulled by a 47841 Friday night to Wymondham and then up the Mid Norfolk Railway to Dereham, where it will be transported to Crewe on Thursday. Obviously to find an electric loco on a non electrified heritage line is unusual so it demanded my attention. Before that I had paid a visit to Konect's depot at Tofton, which was rather empty, but I can't fault the welcome I got. What as friendly bunch of guys they are. Thanks, Mickey, for making me feel so welcome despite me saying who I was!!! It was not a wasted journey, however, as I have the first pics of freshly painted and converted ex London Central VDL Gemini 510 LB02 YWX. 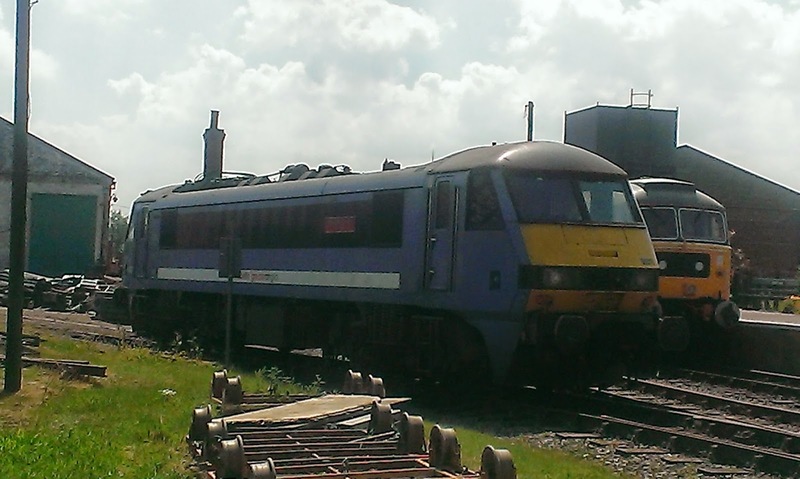 I also got a distant shot of 514 in the workshops. 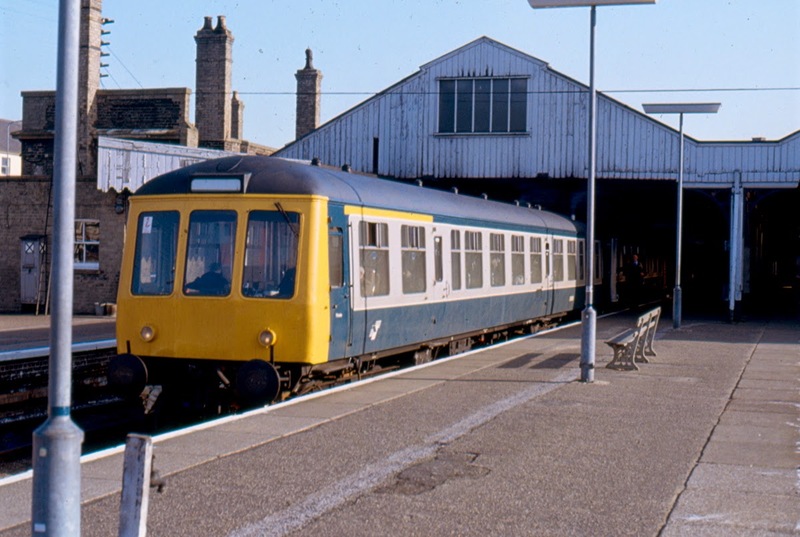 I was undecided which way to go home but afetr hearing from Roy Northcott that 34108 was on the 101's at Lowestoft I decided to see if I could see it and get a ride. 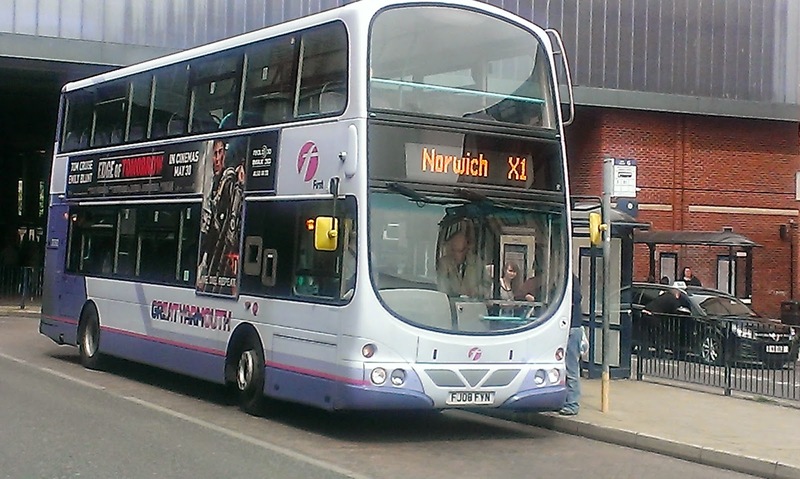 So I caught the X2 from Norwich and promptly passed 34108 at Hales.So I went to Beccles, doubled back to Loddon and got a cracking ride back to Lowestoft on a bus that really should have years left in her, The ride was so comfortable, quiet and smooth. If none of that batch gets preserved it will be criminal. Looks damned good passing through Loddon too. If only the first pic had the destination screen showing! Finally got the destination! Really like this pic. So all in all not a bad day. 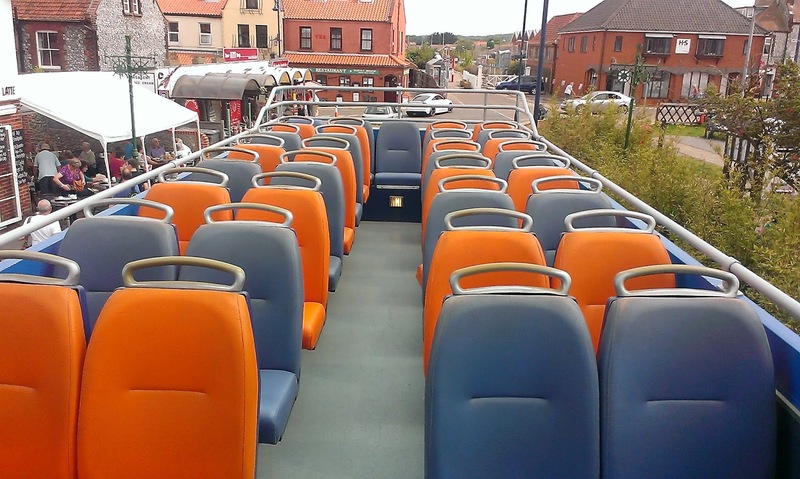 Tomorrow hopefully up to Cromer for a ride on the open topper with no overcoat required! 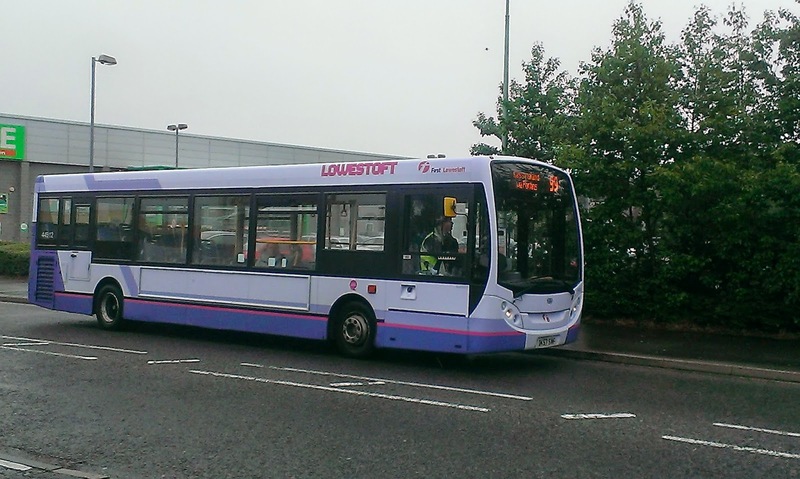 The walking camera that is Sam Larke from Norwich Buses blog went to Beccles today on a mission to spot the ex Konect Loyne bodied Tridents. 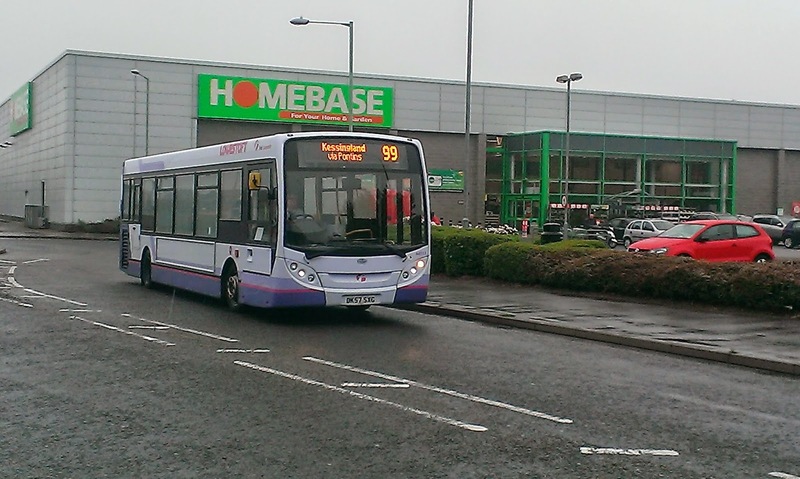 He managed two out of three which as the song goes ain't bad but also got an excellent picture of fire damaged Optare Solo 953 AO57 EXA, which he has kindly invited me to use and publish on here. The damage as you can see is extensive and it's no surprise that it is a write off. It is lucky no one was hurt in the incident, which could have been a lot worse. Many thanks to Sam, and you can read his full post on the link above. The charred remains of Anglian Solo 958 AO57 EXA. 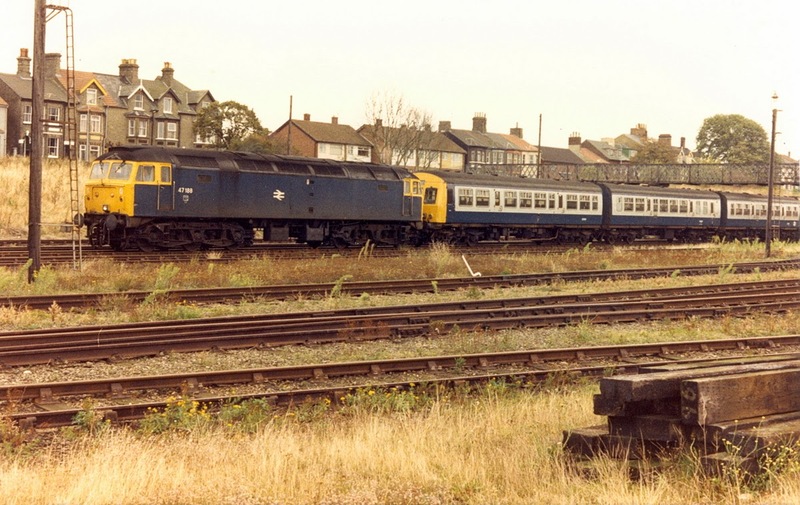 Copyright (C) Sam Larke - NorwichBuses Blog"
The deity that is Syd Eade has been in touch with some pics of various rare diesels working in the Norwich and Lowestoft areas. 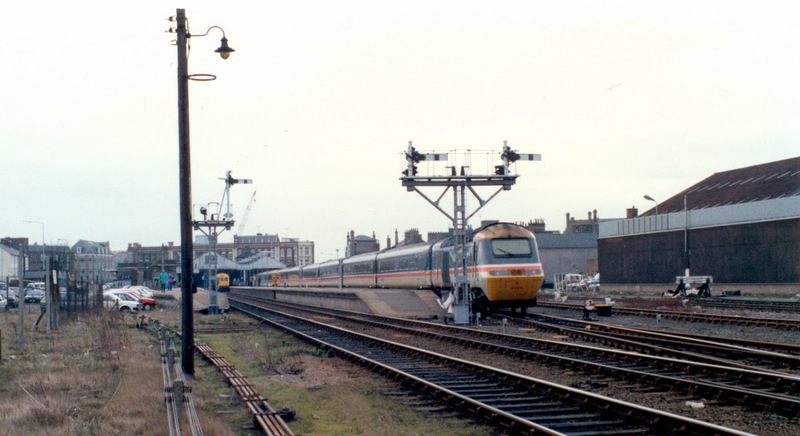 One of them I find extraordinary as I would personally give anything to see an HST at Lowestoft! Oh to go back to those times again. Thanks, Syd, you are a star and all the pics remain copyright to him. 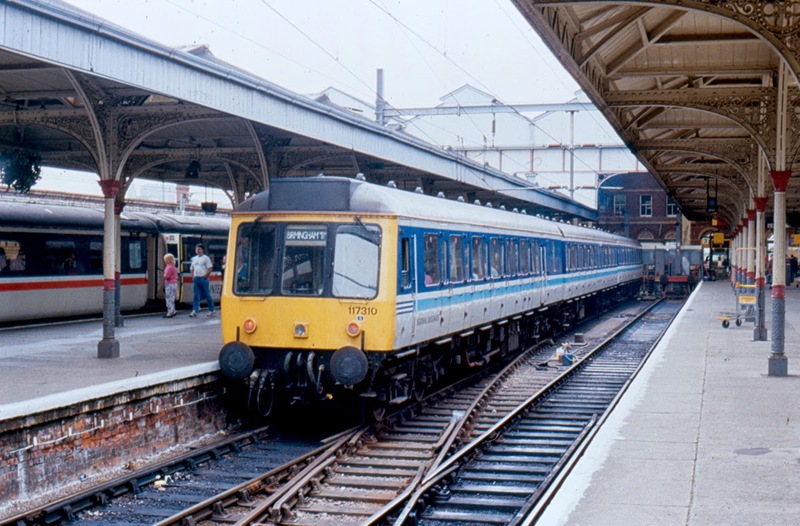 Taken in November 1983 this early version of the Short Set sees 47188 pulling a DMU at Norwich. 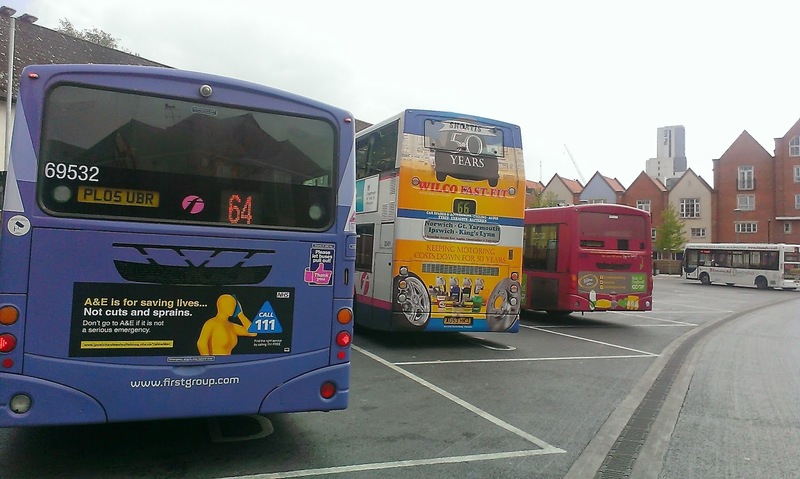 31 years on 47's are still active in Norwich. I had to attend a wedding in Ipswich today and it started well with Ex P&R Volvo B7rle 69428 taking me from Sax to Ipswich. After the wedding I got to Old Cattle Market hoping for a ride on Galloway's new Solo SR. It was not to be but I got second prize - a good look round it and a chat with the driver. The first thing I noticed was the rather thin padding on the seats. 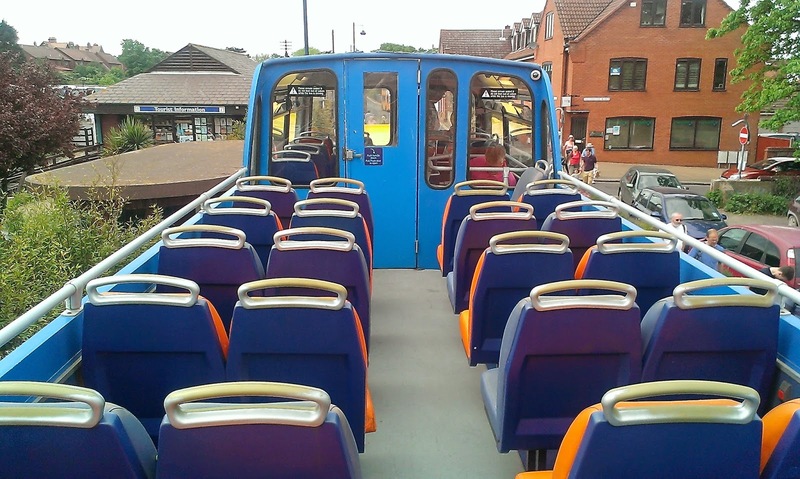 It's a shame in the days of leather seating that Optare think passenger's bottoms still deserve hard seating. ............oh dear it isn't any better and it wasn't even particularly sunny at that point. That is a shame as I really like the styling. so maybe a different type of destination screen is needed - like the X1's perhaps that are not affected by direct light. So I was returned to Framilingham on ex Far East Travel Solo 1482 PP which didn't sound like a Solo at all! 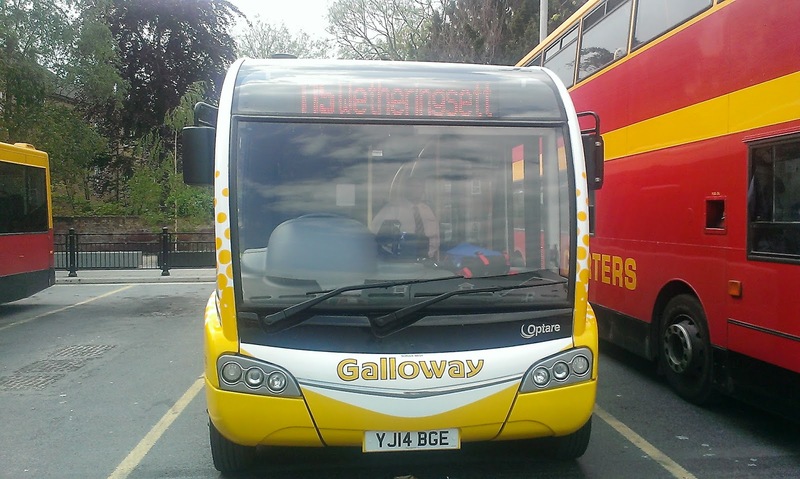 Now the driver of the new one told me about a couple of engine related quirks in the Galloway fleet that I think are deserving of more research and a special feature if I can arrange it. Watch this space. 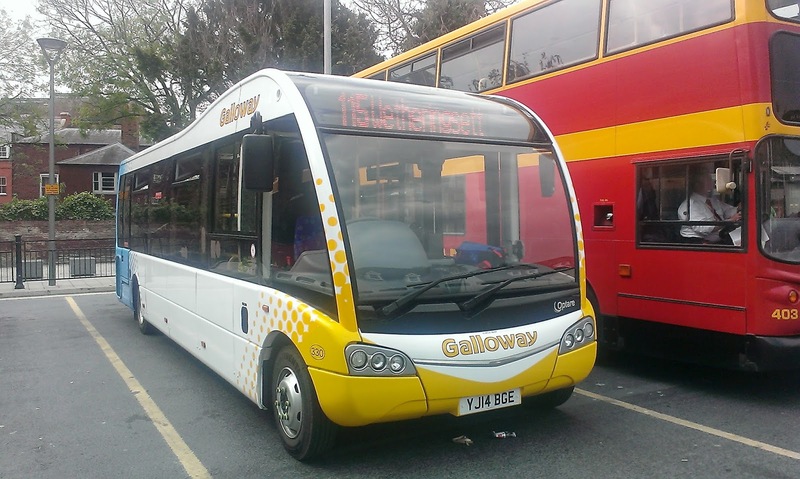 I can also confirm that the Ipswich Buses Solo that was acquired by Galloways has already been repainted and is undergoing safety checks prior to entering service next week. 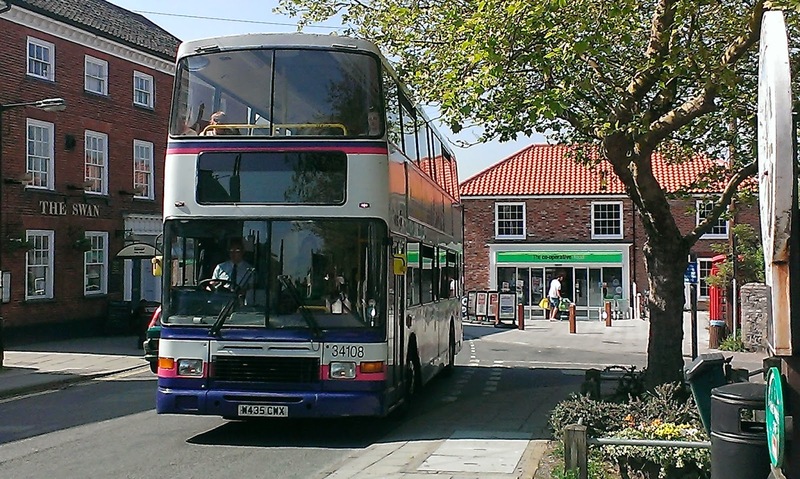 Ex FarEast TRavel Optare Solo 1482 PP at Framlingham in strong sunlight! 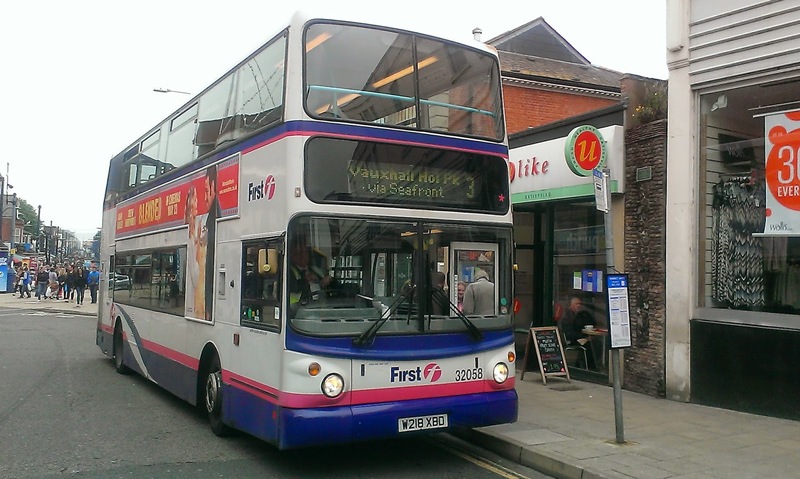 In other news First Ipswich B7tl 32491 AU53 HKJ has had the Wilco read wrap put on it similar to 30261 at Yarmouth. That means 32486 is still running around with the very faded wrap for UEA in Norwich at least 3 years after it left Norwich for Ipswich! Finally tonight if anyone was at the AGM of East Suffolk Travellers Association at Halesworth today where Philip Eden was speaking, then drop me a line and I'll be happy to publicise what was said. 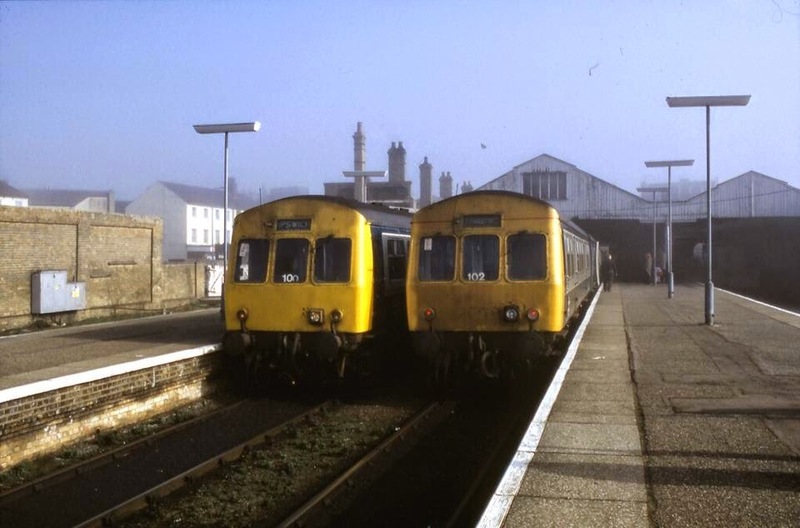 Following on from yesterday's enforced stay at Lowestoft byu the short set, Tim Miller has sent me some old pics he found of Class 101's in various years at Lowestoft, including a couple showing the old roof, which I certainly never saw myself. Wouldn't be nice if you could just flick a switch and go back to those days, if only to see if they were as good as we remember them with our rose tinted specs!! Unfortunately out of the 3 pics only one unit can be identified - 101658, but I'm sure there will be some of you out there who will identify the others. Thanks, Tim, for the pics and enjoy. 101658 sits at the new Lowestoft Station about to leave for Norwich. 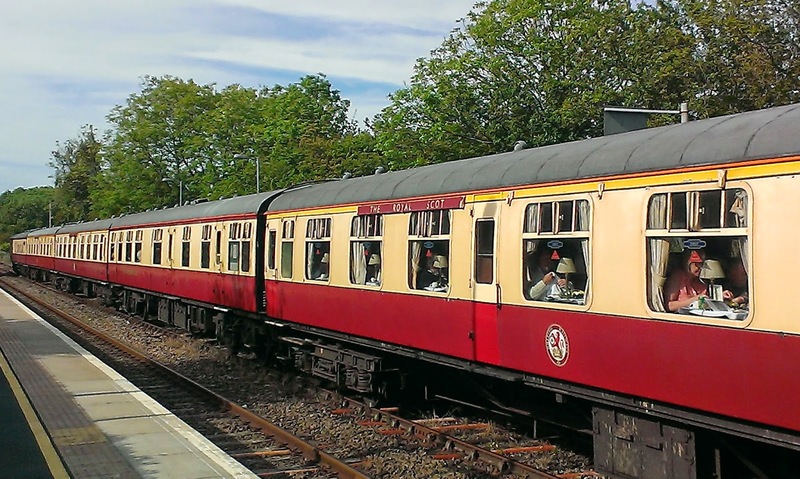 Can someone please tell me what is written before Railways on the side of the train please! I'm beginning to see why they modernised it! Look at the state of those tracks! Looks a nice day there even if those two units look a bit grubby. Is This How To Treat Drivers?